The India Today magazine has shed more light on Britain’s controversial military advice to India about raiding the Golden Temple in 1984. The SAS vetted Operation Sundown, a secret plan for a heli-borne commando raid on the Golden Temple to abduct Sikh leader Bhindranwale, according to unnamed Indian ex-special forces soldiers interviewed by the reputable magazine. 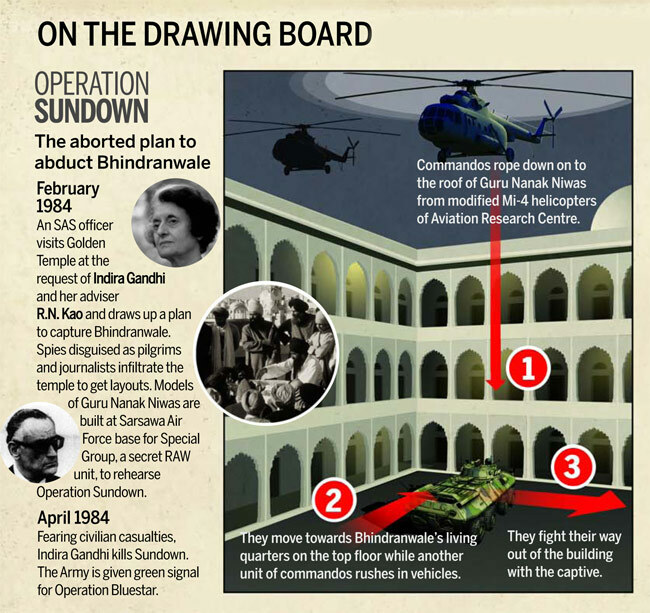 Operation Sundown was developed by India’s intelligence agency RAW, whose Special Group military wing spent two months rehearsing the operation on a mock-up of the temple complex. Indira Gandhi vetoed the plan in April 1984. The magazine also refers to the 2007 book The Kaoboys of R&AW by B. Raman, a former head of RAW’s counter-terrorism division, which claimed two MI5 officers at the British High Commission had carried out surveillance on the Golden Temple complex in December 1983. India Today’s sources claim these MI5 officers then briefed a senior SAS officer sent by the UK to Delhi who deemed the special operation feasible. “The Indian authorities recently sought British advice over a plan to remove Sikh extremists from the Golden Temple in Amritsar. The Foreign Secretary decided to respond favourably to the Indian request and, with the Prime Minister’s agreement, an SAD [sic] officer has visited India and drawn up a plan which has been approved by Mrs Gandhi. The Foreign Secretary believes that the Indian Government may put the plan into operation shortly”. Labour Party MP Tom Watson has called for “an urgent statement” in the House of Commons on Operation Sundown. 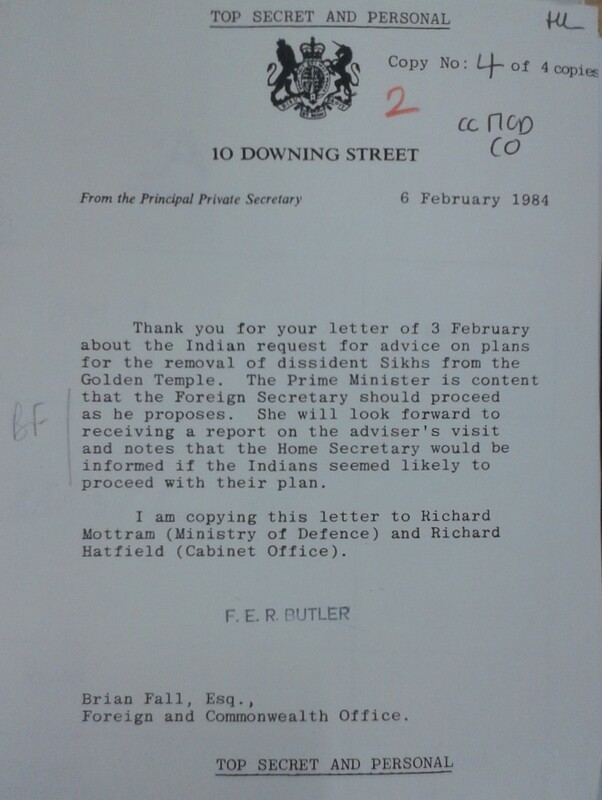 What to do about accidental disclosures that Thatcher’s government advised India on Golden Temple raid? Hold an inquiry. Keep it tight. Sikh leaders in the UK have warned that an official review of British involvement in India’s 1984 Golden Temple massacre is inadequate. Prime Minister David Cameron ordered the review by Cabinet Secretary Sir Jeremy Heywood after I published letters from the National Archives (here), revealing that Prime Minister Margaret Thatcher had sent an SAS military officer to advise India on a plan to retake the Sikh religion’s holiest site, in Amritsar. Indian troops raided the Golden Temple complex (Sri Harmandir Sahib) in June 1984 in a six-day assault codenamed Operation Blue Star. Sikhs claimed that thousands of people were killed. Indira Gandhi’s government estimated the death toll at 400. In Whitehall this past Wednesday Sir Jeremy Heywood met with representatives from twelve Sikh community groups “to clarify the remit and limitations of his inquiry”. His terms of reference remain unpublished. Heywood, the UK’s most senior civil servant, proposes to limit his investigation to events leading up to the raid. Sikh leaders told him his scope was “too narrow” and urged him also to review later military operations in the Punjab, specifically Operations Woodrose and Black Thunder, to check for any further British complicity in India’s crackdown on Sikhs. Heywood assured the Sikh deputation that his team had over the past fortnight reviewed 2,500 documents from 200 files across several government departments including the Home Office, Foreign & Commonwealth Office and Cabinet Office. He has apparently interviewed the former ministers and senior civil servants named in those papers. He told the meeting that the incendiary letters “came out in error” when they were given to the National Archives among the New Year releases. Sikh groups remain suspicious that significant papers may already have been destroyed. Next week, Heywood is due to hand over his findings to the Prime Minister who will decide on what to make public. The Sikh Federation warned Heywood that they may then ask for a judicial review. The Sikh justice group Kesri Lehar has repeated its call for a full parliamentary inquiry. Operation Woodrose was an Indian army sweep through rural Punjab in the months after the Golden Temple massacre to detain thousands of Sikhs for membership of banned political groups. Allegations of torture during interrogation were rife. Operation Black Thunder refers to two more raids on the Golden Temple conducted by Indian security forces in 1986 and 1988. Conservative Party strategists, who view the Sikh community as a key electoral constituency, may wish to note Sikh concern about the Coaltion government’s commitment to transparency. Thatcher sent SAS to advise Indira Gandhi on Indian army plans “for the removal of dissident Sikhs from the Golden Temple” months before disastrous raid on Amritsar, top secret UK file reveals. When Indian Prime Minister Indira Gandhi ordered the army to storm the Golden Temple in Amritsar in June 1984, it was a decision that would lead to her assassination. The assault on the Sikh holy site to evict separatist leader Jarnail Singh Bhindranwale, involving tanks and helicopters, incurred heavy civilian casualties. Outraged Sikhs in Britain responded with a huge demonstration in Hyde Park, and thousands more sought refuge in the UK as the violence in Delhi and the Punjab escalated, in what some call India’s Sikh genocide. 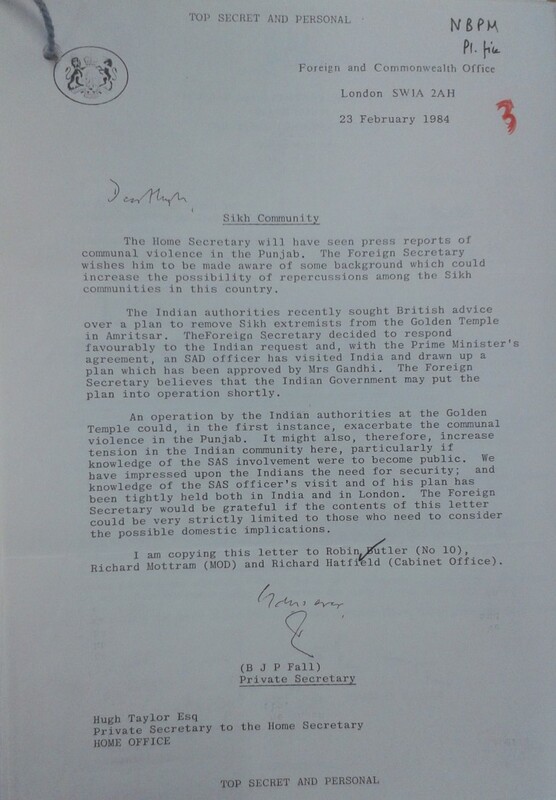 Top secret Whitehall correspondence now reveals that British special forces advised Indian leaders on retaking Amritsar, despite acknowledging privately that “an operation by the Indian authorities at the Golden Temple could, in the first instance, exacerbate the communal violence in the Punjab”. In a remarkable series of letters, buried among the New Year releases at the National Archives in Kew, south west London, I discovered the gamble that Thatcher’s administration took with the volatile situation in India and the diaspora. A letter dated 23rd February 1984, titled ‘Sikh Community’, noted “The Home Secretary will have seen press reports of communal violence in the Punjab. The Foreign Secretary wishes him to be made aware of some background which could increase the possibility of repercussions among the Sikh communities in this country”. The ‘background’ in question was the covert role of an elite British military adviser in India. The file stops short of detailing this “plan”, so it is not clear how similar this was to Operation Blue Star, the code name for the eventual assault in June. However, three other letters in this chain (between Thatcher’s private secretary Robin Butler and his counterpart at the Foreign Office) have been weeded out of the file and remain classified. The file stops in March 1984, and the next part of the folio is still unavailable, obscuring more details about the months leading up to the raid. “increase tension in the Indian community here, particularly if knowledge of the SAS involvement were to become public. We have impressed upon the Indians the need for security; and knowledge of the SAS officer’s visit and of his plan has been tightly held both in India and in London. The Foreign Secretary would be grateful if the contents of this letter could be strictly limited to those who need to consider the possible domestic implications”. Only four copies of the letter (stamped ‘Top Secret and Personal’) were made, and circulated to principal private secretaries at Downing Street, the Cabinet Office and the Ministry of Defence, to keep the operation under wraps. Despite these precautions, SAS involvement was rumoured in a Sunday Times article written by Anne Mary Weaver shortly after the raid in June. This new evidence provides conclusive proof that British Special Forces were involved with planning a raid on the Temple. It also starkly reveals the risks involved with Thatcher’s covert foreign policy for events in India and Britain. The majority of letters in the file relate to Thatcher’s involvement in negotiating British arms sales to India. 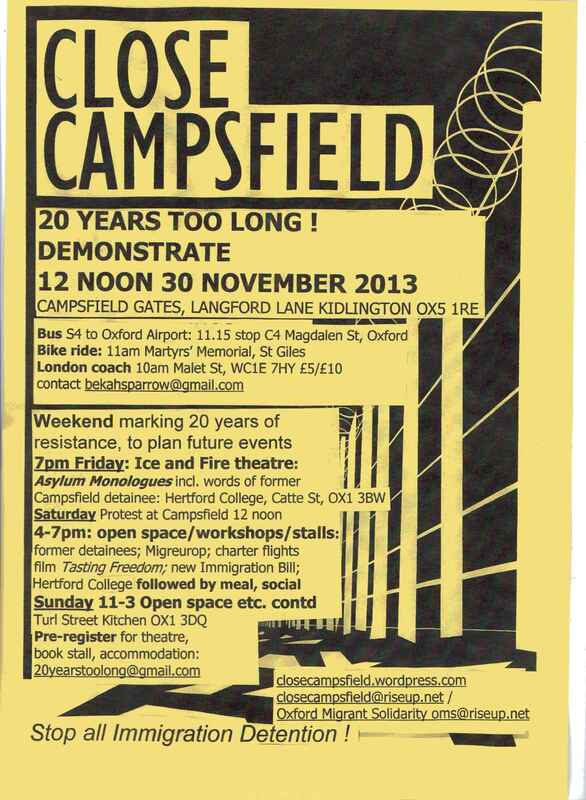 Weekend of events to mark 20 years of resistance from inside and outside of Campsfield, and plan future action. 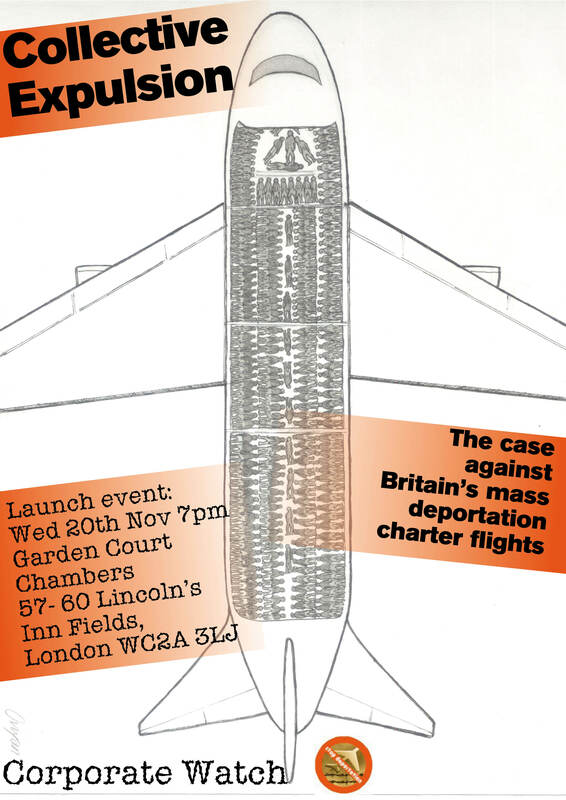 Corporate Watch and Stop Deportation invite all those concerned to the launch of our major new report: ‘Collective Expulsion: The case against Britain’s mass deportation charter flights’. The launch will be combined with a workshop involving legal practitioners and campaigners who work on this issue to explore ways we can challenge and stop charter flights. The event will be held at Garden Court Chambers on Wednesday 20th November, 7pm. Some of our findings were reported already in the Guardian, Private Eye, Open Democracy and on the Freemovement immigration law blog. The UK’s Home Office has used specially chartered flights to deport rejected refugees and migrants en masse for 12 years now. Charter flights are becoming the standard method of conducting enforced deportations to a growing list of destination countries. There is now at least one flight a week to ‘popular destinations’, such as Afghanistan, Pakistan and Nigeria, which are often closely linked to the UK’s most controversial foreign policy adventures. The policy was introduced in 2001 ostensibly to save ‘taxpayers’ money’ and effect ‘volume removals’ of people who refuse to ‘cooperate’ with the immigration authorities. Officials have also claimed the programme was designed to send a clear message, both to the British public and to migrant communities, that the UK is serious about enforcing its ‘tough’ immigration policy. Yet, the programme was, and is still being, sold to the public on the basis of unfounded myths and outright lies, which have gone unchallenged for far too long. This report, examines in detail each of these and other deceptions underpinning the programme and debunks them using previously unpublished data covering the first 10 years of the programme. The sources range from Freedom of Information requests, statistical analysis of official figures, court cases, to government and media reports, in addition to case studies based on testimonies from migrants deported on these flights or organisations that worked with them. Having debunked the myths, the report’s authors, Phil Miller and Shiar Youssef, then attempt to unravel the ‘ulterior motives’ behind the UK’s deportation charter flights, bringing to light little-known statements by government officials, secretive meetings and agreements and dodgy political deals. The motives examined range from a targets culture introduced by Labour and maintained by the current, Conservatives-led coalition government, to political agendas revolving around the UK’s foreign policy and disciplining migrant diaspora communities. The next section explores a number of important legal questions concerning mass deportation flights, delving into the murky depths of European and UK case law, international treaties and other legal instruments. Among other things, the authors argue that deportation charter flights constitute a de facto policy of ‘collective expulsion’ and must, therefore, be prohibited. Even without this, a number of procedural issues that can be used to challenge the legality of these flights are also explored in detail. This is followed by two short sections on specific issues with significant legal implications: overbooking and the use of ‘reserves’, and the more recent use of monitors and doctors on mass deportation flights. It is important to remember that, unlike deportations by commercial flights, there are no other commercial and procedural barriers to the exceptional, brutal policies and practices surrounding mass deportation charter flights. There are also no other passengers to witness what happens on these flights – unlike the unlawful killing of Jimmy Mubenga, which took place in full view of British Airways customers, leading to a damning inquest verdict on the use of fatal restraint techniques. On charter flights, immigration officers and private security guards can virtually get away with anything, as they often do, in order to enforce the government’s ‘tough’ immigration policy. Hence, this report not only calls for the immediate halt of the deportation charters programme on the basis of detailed factual findings and legal arguments, but also challenges different practices and procedures that have been institutionalised or taken for granted during the 12 years of this shadowy programme. To achieve this, we would like to bring together as many campaigners and legal practitioners interested in these issues as possible, and explore ways in which they can collaborate and work together more effectively in order to stop these flights. This is particularly important now, in the context of mass deportations becoming an integral part of the UK’s ‘immigration management’ regime, a regime that has recently seen new worrying and xenophobic developments, such as regular immigration checks on the street and the ‘go home’ advert vans. Mass deportations, using specially chartered aircraft away from the public gaze, are a logical extension of this drive to get rid of as many unwanted migrants as possible by any means possible. 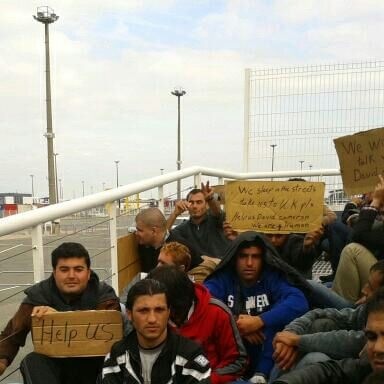 French police are attempting to clear a protest by 65 Syrian refugees in Calais this morning. 2 young men are on the roof of the port’s departure lounge, threatening to jump unless their demand to enter the UK is met. 20 of the group are entering their third day of hunger strike. The protesters want a representative from the UK to come to Calais to speak to them and grant them refuge in the UK. This morning at 7.30 am around 70 riot police and border guards arrived at the departure lounge to violently evict the 65 Syrian refugees on protest there since 2 pm yesterday. At 8:00 am today a representative of the local Prefecture (regional official) arrived to start negotiations with those on the roof. He is trying to make contact with the UK Government for their response. families, old women, mothers, children the youngest being three years old and friends’. The refugees are also angry with the inhumane treatment that they are receiving in France. The last month has seen an escalation in the harassment of migrants in Calais. Evictions of shelters,destruction of people’s property and arrests have been taking place on a daily basis. Extensive coverage in French media but not picked up yet by UK press. ‘We have been here now between one and two months. We are about 65 people from Syria at the port at the moment, with our families, old women, mothers, children the youngest being three years old and friends. There is nowhere safe for us to shelter in Calais, we are here just for one thing and that is to have asylum in England. Many of us have family and friends in England who we would like to see and be able to live with. There is also a strong Syrian community there, more than in France. 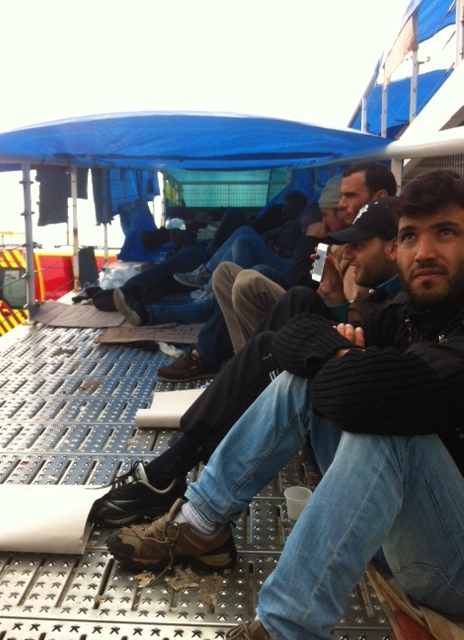 We are now demonstrating in the port of Calais, we will not leave until they let us go to England. We demand one person from the UK home office comes here to speak with us, and to see our situation. We have the right to claim asylum in England, but how do we get there? There is not a legal way to cross. We are about 65 people from Syria at the port at the moment, with our families, old women, mothers, children the youngest being three years old and friends. 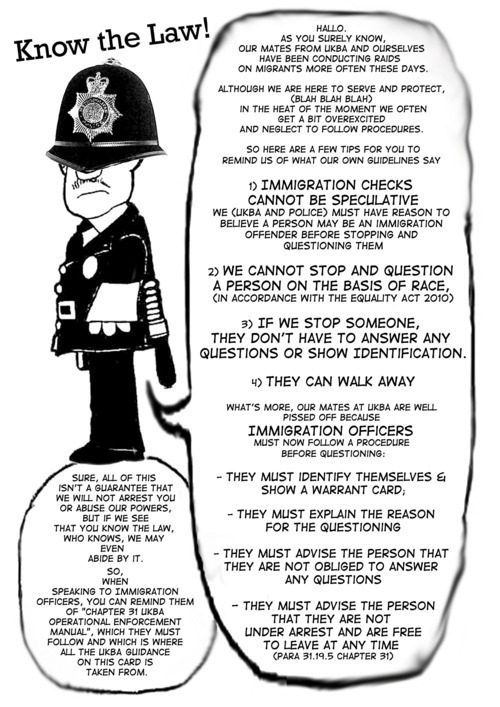 Great legal advice from Bhatt Murphy solicitors about YOUR RIGHTS in an immigration check.